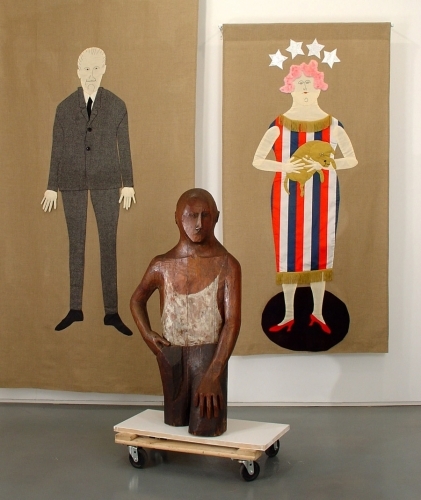 “Fabric and Wood” is the title bestowed on Louise Kruger’s upcoming exhibition at Lori Bookstein (June 9th – July 9th, Reception: June 9th, 6-8 p.m.). It is somewhat misleading and enchantingly understated, considering Kruger’s wholehearted embrace of the fantastical and her focus on offbeat characters. Many of the works on display will date from the 1960s, reminding in style and mood of Kruger’s contemporary, the New York-based artist Marisol. Kruger, like Marisol, has worked extensively in wood — creating figures that embrace a naïve roughness that is usually found in folk art. Women dressed in fabrics that remind of post-war lampshades or a semi-Dixian soldier with skeleton legs grounding him to the floor, make up part Kruger’s “Sammelsorium” and translate as a sympathetic homage to the misfits of the world. This show promises a most unique blend of sentiments, ranging from sweet and charming to sinister.